Well, you know… we all want to change the world—to a simpler and safer place for pets that is! There is a veritable smorgasbord of preventatives on the pet medication buffet, but how do you tell which is the correct choice for your pet? Well, in the interest of pet revelations and the commonwealth of cats and dogs everywhere, here is a brief account of the advantages of two popular items on most every pet owner’s radar. Revolution and Frontline Plus. Both Revolution and Frontline Plus will treat the basic parasites: fleas and ticks. However, they differ in their methods and applicability. Both are spot-on medications applied to the back of your pet’s neck. This saves you the trouble of covering a tablet in peanut-butter and deceiving your trusting companions. These medications deserve their due diligence as fine and effective products. Though Revolution and Frontline Plus both share a degree of notoriety, Frontline plus is probably the better known of the two. Though it suffers some criticism at the hands of sporadic posters on many pet forums, it maintains a merited respectable reputation. It is a multi-action parasite medication that attacks every stage of the flea life cycle, neutralizing flea eggs, inhibiting larval growth and killing adult fleas. While offering comprehensive protection against fleas, Frontline Plus also tackles those troublesome ticks and lice. Revolution is also a multi-action parasite medication. 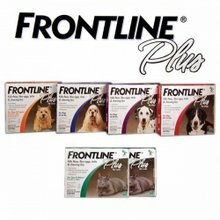 Revolution will defend your dog or cat from fleas and ticks just like Frontline Plus. The flea protection offered by both products is identical as Revolution is no respecter of age when it comes to eliminating fleas, though it treats a much more limited variety of ticks as compared to Frontline Plus. Whereas Frontline protects against American Dog Ticks, Brown Ticks, Lone Star Ticks, and Deer Ticks too; Revolution only offers defense against the most prevalent of those listed above: The American Dog Tick. The main advantage of Revolution is that it also treats deadly heartworms, invasive Ear Mites, and even intestinal parasites in cats. Heartworm prevention is pretty important to a pet owner, and not having to administer two separate medications for these parasites is a pretty big advantage for Revolution. However, if you live in an area proliferated by more than the run-of-the-mill tick population it might behoove you to stock up on Frontline Plus instead. 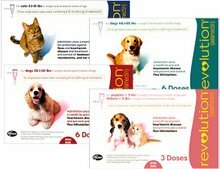 Revolution and Frontline plus are both effective in the most common uses of pet medications, and each has its own standout characteristics making it more or less attractive according to consumer preferences. Whichever you choose you’re likely to be a powerfully satisfied return customer for years to come. The main thing to remember is that none of the medications you research are really “better” or “worse” than any other. They simply offer distinctly different advantages and disadvantages. Do your research and carefully consider the possibilities before deciding on the best course of treatment for your fuzziest family members.